We did the Central Coast Tour for our Spring Break trip. (You know how we like to go out of town any chance we get.) Kelly and Julio graciously opened their home to us and let us come stay for 3 nights. The kids have lovingly named it "The Julio Hotel" - which does not seem quite fair because the house does belong to Kelly and Lucy as well. Maybe we should call it the "Hernandez Hotel" instead. So we began our trip right after General Conference ended. We drove down to Kelly and Julio's house with a plan to do a bonfire on the beach and roast hot dogs for dinner. About 20 minutes down the road ol' Jackson threw up in the car. Oh yeah, you parents out there know exactly what that is like. We cleaned it up as best as we could and continued on down the road. Jeremy and I crossed our fingers and hoped it was just a case of car sickness. It happened again. And again. (And maybe one last time, but I can't be sure.) We called Kelly to let her know we'd be there later than we thought because of all the clean up stops we had to make. So we decided to change our fancy dinner plans. Instead of a bonfire on the beach we opted for a picnic at the park just across the street from the Hernandez Hotel. After we arrived, unloaded a bit, and set up our "camp" in their living room we headed over to the park for dinner. Jackson tossed his cookies one more time and the rest of the kids had fun running around and releasing some of that pent up energy from traveling in the car. That was about all the fun we had on day one. Day 2 was more action packed. We began at Avila Beach. This beach is our favorite for the kids. The waves are small and it is never crowded. 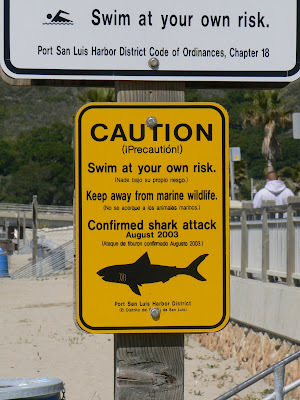 This sign greeted us when we walked onto the beach. That's welcoming, right? Jeremy helped the kids build an awesome sand castle. It had a mote and three tunnels - boy, those kids don't know how lucky they are. 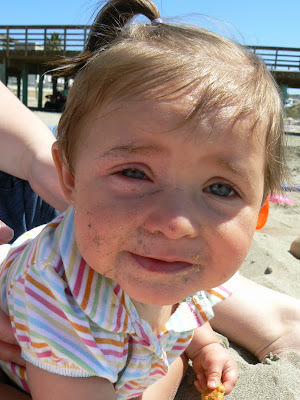 Poor Baby Lucy got some sunscreen in her eye and spent most of the day looking like a pirate (argh!) because it swelled up a bit. She didn't complain about it once! Lucy was content just to be there and eat as much sand as she could get away with. And check out her first ever pony tail! Oooh! It's so fun to play dress up! Logan and Lizzie hammed it up for the camera. They were so happy to be at the beach and to have it feel like summer time. They rolled around the warm sand all day. That last picture gives new meaning to "sugar coated sticky buns".